Rextester - some online tools for anyone who finds them useful. It was started as online .net regex tester. Rextester stands for regular expression tester. Regex tester - .net regex tester. Regex replace - .net regex replacement. Regex reference - short regex reference. Diff checker - find difference between two text fragments. Run code - online compiling and execution for some languages. .Net framework v. 4.5 is used. Your code will be given max 5 sec of cpu time and limited memory (~150 Mb). Also your code will run in an appdomain with basic execution, reflection, thread control and web privileges only. If you found security breaches and can break something in some way - we would appreciate your feedback on this. Sql Server 2014 Express Edition is used. There is only one database that queries run against. Queries executed on behalf database owner so all sort of actions are allowed including DDL queries. However, all actions run in transaction which is rolled back immediately after execution is over. This way any desired objects may be built, populated with data and worked on within the scope of one request. There is 10 seconds limit for work to be completed. 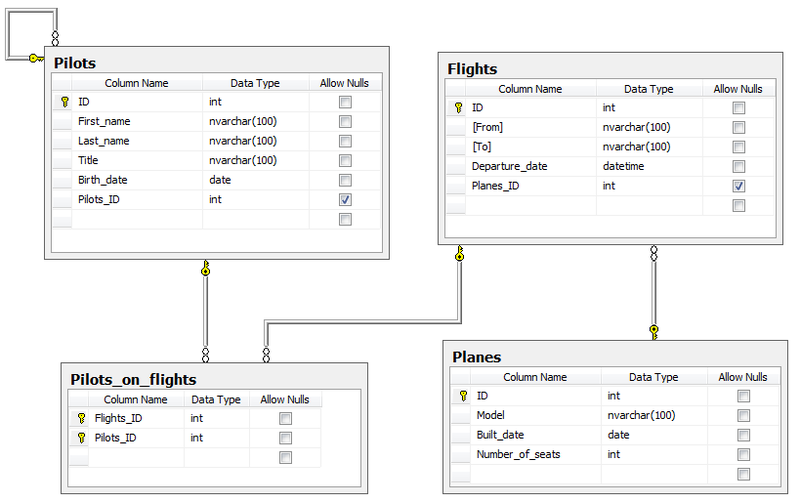 Execution of queries is achieved using ado.net mechanisms, in particular SqlDataReader type. This reader is also monitored for memory and cpu consumption. 'GO' statement just like in transact sql has special meaning: 'GO' will be removed from your code, but statements separated by 'GO' will be executed separately, in different batches. So, for example, if you want to create a function and later use it in select statement you have to separate create statement and select statement by 'GO', otherwise you'll receive an error from parser since in select statement you would be reffering to a function which doesn't yet exist. For convinience there is simple pre-built schema, shown here. MySQL version 5.7.12 is used (on Windows). There is only one database that queries run against. Queries executed on behalf database owner so all sort of actions are allowed including DDL queries. However, all actions run in transaction which is rolled back immediately after execution is over. This way any desired objects may be built, populated with data and worked on within the scope of one request. There is 10 seconds limit for work to be completed. Unfortunately MySQL doesn't support rollback of DDL statements, so once object is created it stays. Therefore one should check if object exists before creating it and ideally drop it at the end of the script. PostgreSQL setup is simillar to Sql Server. Oracle setup is simillar to MySQL. Your code is compiled to native binary which runs on Windows Server 2012 (maximum compile time is 30 seconds). Your process will be associated with job object that has LimitFlags.JOB_OBJECT_LIMIT_KILL_ON_JOB_CLOSE flag set. After 10 seconds of execution this process will be killed. This used to be the only security measures for a while. However, after discovering dubious services running and questionable .exes at some weird places it was decided to sandbox all usercode through Sandboxie. Also let us know if you need some other Windows-based compilers. Your code will be run on behalf special user and group. Also your code will be executed from Python wrapper which sets various limits to the process. It does so by using 'setrlimit' system call. You'll have max 30 sec to compile, max 5 sec of cpu time to run, limited memory (~1500 Mb) and other restrictions will apply (like no writing permissions). Also your process and all its children will be run in a newly created process group which will be terminated after 10 seconds from start if still running. We don't claim that this is secure. In many senses you'll have the power of special user. On a bright side, this has some useful side-effects. The reason why, at least for now, we leave so many potential security breaches is because it's hard to make it really secure. What are the options? Codepad seems to 'ptrace' everything and disallow many system calls, for example, 'fork()'. That's pretty restrictive. Apparmor - out of everything we tried, this did the job pretty well and it was rather easy to configure. But it doesn't work with OpenVZ virtualization that is used by our server provider. SELinux - stopped reading documentation in the middle of it. Too (unnecessarily?) complex. Native security mechanisms - like chroot and file permissions. Hard to make it secure this way without breaking the service and the system. So, if you can take the system down - then be it, but please report how you did this. Your advice on this topic is always welcome. Everything that will be submitted as input will be piped to process via stdin stream. So your code should consume input as if it came from keyboard. Write code so that others see this real-time. Every participant can make changes and see changes made by others. We use Firepad and Firebase. Special thanks goes to people behind CodeMirror, Edit area, Roslyn, MarkdownDeep, Firepad (and Firebase) and Coderev. Code wall as well as personal code walls - place code on a wall for public display. These entries will be crawled by search engines, so one possible use is to put there scripts that you may need for easy access later. For example, whenever I need a sql script for searching database definitions I simply search for 'sql definition rextester' and there is my script (it seems that code wall is crawled better than personal walls, though). It's important that code snippet have a meaningful title. Feedback - give us feedback. We have implemented a lot of requests so far. Login - once logged in you'll be able to track your saved snippets and more.